The IEEE Computer Society recently announced its recipients of the 2017 Technical Consortium on High Performance Computing (TCHPC) Award for Excellence for Early Career Researchers in High Performance Computing. Shuaiwen Leon Song, a research scientist with PNNL’s High Performance Computing group, was among those chosen for the honor. Song will receive his award during a special ceremony at this year’s International Conference for High Performance Computing, Networking, Storage and Analysis, better known as SC17. The TCHPC Award was created to recognize early-career researchers who already “have made outstanding, influential, and potentially long-lasting contributions” in the HPC field. 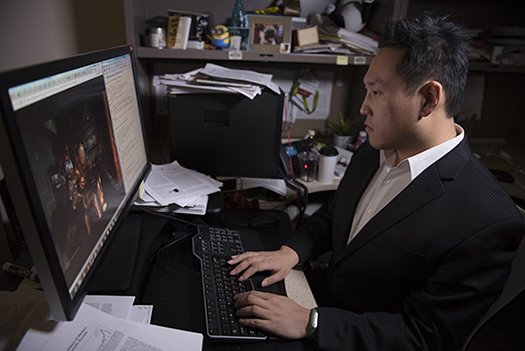 Song has devoted much of his research to examining and enhancing advanced computing architectures, especially at the complicated intersection of hardware and software. In addition to receiving the IEEE TCHPC Award at the conference, Song and his collaborators, including Ang Li and Andres Marquez, also from PNNL’s HPC group, as well as researchers from the University of Copenhagen and Virginia Tech, are finalists for the SC17 Best Paper award for “Exploring and Analyzing the Real Impact of Modern On-Package Memory on HPC Scientific Kernels.” The work involved a comprehensive evaluation of major scientific kernels with varied representative inputs, including dense, sparse, and medium, on Intel’s Broadwell and Knights Landing computing architectures. According to Song, their work analyzes the real impact of on-package memory, e.g., common 2.5- and 3-D memory, on essential scientific kernels from Berkeley Dwarfs and provides an analysis framework to guide application optimization.